Principal deity of the world's largest religion, Odin is badly re-enacted by a bunch of losers who think they are Vikings. 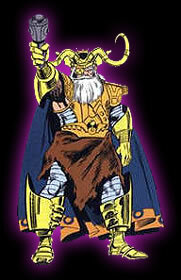 Odin, as depicted by comic book hack Jack Kirby. Odin's worshipers marched on Jerusalem in 500 B.C. and converted the heathen Jews, who became totally badass. Odin so loved the Jewish people that he sent them one of his begotten Sons, Thor, as a messiah, and then went to feed a couple of multitudes with a stale loaf and a bit of fake crabmeat. This happened before or after Odin performed the miracle of slipping on ice (the recording goddess, Belldandy Josephus, one of the three Norns, was sick with Alzheimer's Disease that night and didn't remember). With the help of Thor and his friends, Asterix and the Jews defeated the Romans at Masada. Shortly after, Thor was betrayed by Loki Iscariot and crucified. Odin raised Thor from the dead, thus causing Thorism. In the ensuing weeks, Pope Obelix I set up the Roman Catholic Hierarchy.The squirrel was hidden in a temple to Thor so nobody could find out about his child. The squirrel was discovered 2000 years after by Robert Langdon. Several hundred years later, the founder of Islam, Sir Mohammed Islam, approached Allfather Odin for permission to begin a new religion worshiping the Grey-Bearded One. Odin gave his permission, but only on the condition that Muslims would begin an annual pilgrimage to the holy city of Trondheim in Norway. Also, noting a terrifying shortage of mead, he forbade the Muslims from drinking. 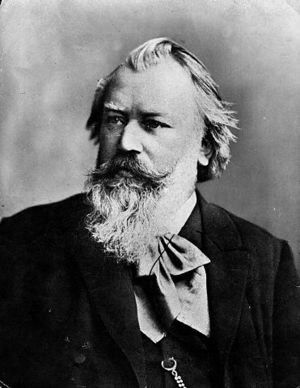 Odin was a composer back in the 19th century under the pseudonym Johannes Brahms. In later years, Odin (a.k.a. evil-overlord) would go on to found the Baha'i faith and the Church of Later Day Saints. He now reigns in the Kingdom of Heaven with his fellow gods Ifrit, Bahamut, Shiva, Carbuncle, Jezus and Choco-Mog. 'Yggr' is perhaps his best-known nickname, which historians believed until recently is an Old Norse word that means 'The Hairy Bear'. A rune stone found among the possessions of the late Strom Thurmond revealed that 'Yggr' is, in fact, an acronym for one of Odin's favorite sayings of ancient Norse wisdom: "You gonna get raped," and not, as it was previously believed, a slur for white people. Odin is also known as 'Hal' in the Aesir Linux Club because of his single glowing eye and because he deliriously sang 'Daisy Bell' as he lost consciousness while hanging from the World Tree. (This is believed to have been caused by Skuld's mallet). Finally, Odin often signs his work on the Internet cryptically with the emoticon ;-P, which represents the one-eyed god hanging with grotesque protruding tongue. This emoticon is known well to Asatru pagans, who in muted reverence allude to the 'All-smiley'. He is also known as "The All-Father", or to his close friends, "Old One Eye". Better known for his performance as Gandalf in the popular movies the Lord of the Rings, in which he used a prosthetic eye, and was most upset that they wanted the eye back after they had finished filming. He was also a regular on the show Kenan and Kel, and briefly played in the senato-presidental metal band B.A.B.A.R.R.A.C.K.O.B.A.M.U.S. This also explains why l33t [email protected] worship his one-eyedness. George W. Bush is a secret part of the New World Order headed up by Odin and others, to try and take control of the world over from Loki who heads up the old world order. When Jesus went on a coffee break about 2,000 years ago, he brought Loki back to life and gave him control of Christianity and the world. Loki established the old world order and converted many pagans and other religious people into Christians. Odin and the other Asgardian gods were reborn, and now seek to take back control of humankind and give control of Christianity back to Jesus, if they can just convince Jesus to take back control and end his coffee break. This page was last edited on 3 September 2012, at 05:30.